Grab Shot 33 - "Red and Black"
"Had a 7-hour layover in Amsterdam, so I took a train downtown and started looking for pictures with no sense of direction or purpose," said Muyi Abifarin. 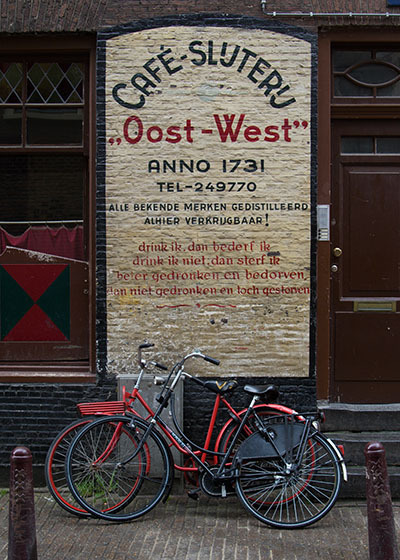 "The first picture I saw was a black and red bike parked under a black and red sign by what seemed to be a closed bar. I took about three hand held shots at about 6:45 AM, right before the city was awake." I then got nervous because I was by myself in an alley holding an expensive camera, passport, and boarding pass with a couple of men I had seen earlier approaching. Wish I could have taken a few more frames without the two pillars in front. Muyi captured the picture with a Canon 20D and Tamron 28-75mm lens. The camera was set to f/4.5, 1/100sec, and ISO 200. Nice to see you make postings on this topic, I should bookmark this web site. Just keep up the good work. I glad reading your post. Thank you so much for share good information.